The classic Christmas movie Elf is ready to celebrate the holidays early with new Buddy the Elf themed sugar cookie dough. Pillsbury has revealed the new Ready to Bake product, which features an image of Buddy's hat on every cookie. These will certainly fly off the shelves, so be on the lookout for them at Target and Walmart this holiday season and be sure to keep them from anyone you know who is like Buddy and super into eating desserts. 2003's Elf is a holiday movie classic and has been since its release, which is pretty rare these days. 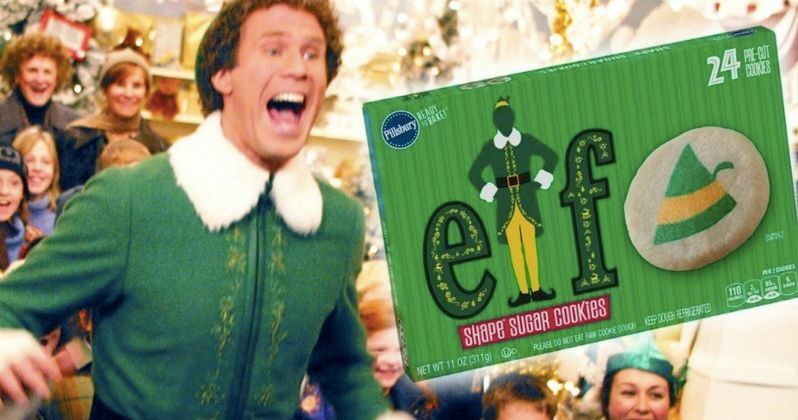 Will Ferrell's performance as Buddy the Elf has been warming hearts and creating laughs for 15 years now, which means that it's about time that the famous elf is honored with his own sugar cookie dough. If that weren't enough, there's a line of Elf Funko Pop! figures, an excellent Mr. Narwhal shot glass, and other goodies that are available as well. However, the cookies are definitely the best, just because we all know that Buddy the Elf would eat a whole can of the raw dough by himself. Elf was a giant success at the box office upon its release in 2003. The film made over $220 million worldwide off of an initial $33 million budget. Will Ferrell plays Buddy the Elf as an orphan who is raised in Santa's workshop and believes that he is an elf, though he is human. When he learns of his heritage, he heads to New York City to locate his father, spreading Christmas joy to everybody, even the biggest cynics, on his journey. Though the part of Buddy was originally offered to Jim Carrey, it seems like it was tailor-made for Ferrell. In 2013, Elf director Jon Favreau announced plans to make a sequel entitled Elf 2: Buddy Saves Christmas. However, the idea was later canned after Will Ferrell revealed that he did not want to make a sequel. Later in 2016, Favreau expressed interest in making the sequel again, but Ferrell repeated his answer from 2013, which is probably for the best. While a sequel would be welcomed with open arms by fans of the original, it would be very hard to come even close to the magic of the first film. Though a sequel was never made, there is an Elf claymation Christmas special that has also become somewhat of a tradition in its own right. We probably won't be seeing a sequel to Elf any time soon, but we can still celebrate the holiday classic with the awesome Buddy the Elf sugar cookies this year. Families can get together to watch the movie and prepare the Ready to Bake cookies together, adding another element of family time this Christmas. It isn't clear how long the dough will be available, so it might be a good idea to track it down now, while you still can. You can check out an image of the Elf-themed Pillsbury cookie dough below, thanks to the Pillsbury.